New Mexico ... What a Gorgeous State! Come visit us. Anyone who has read my blogs knows I am in love with New Mexico. 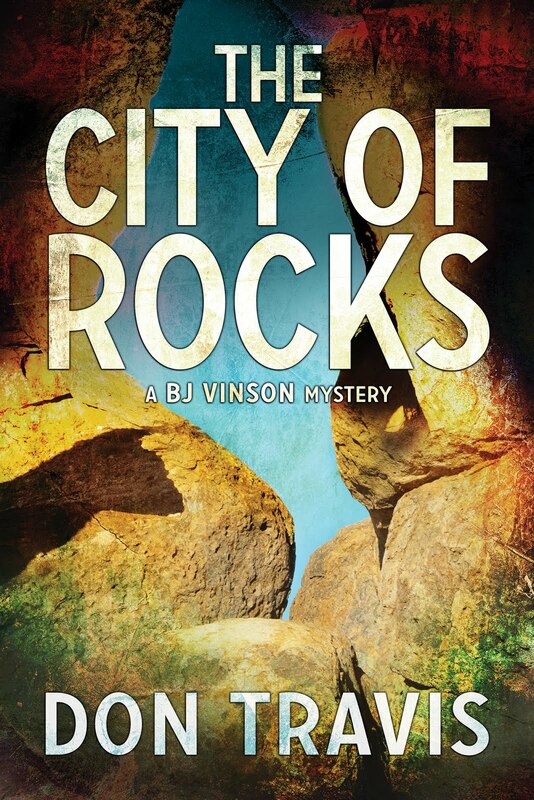 My books, the BJ Vinson series, extol the beauties of the land almost as much as they concentrate on the mysteries that occupy the protagonist. 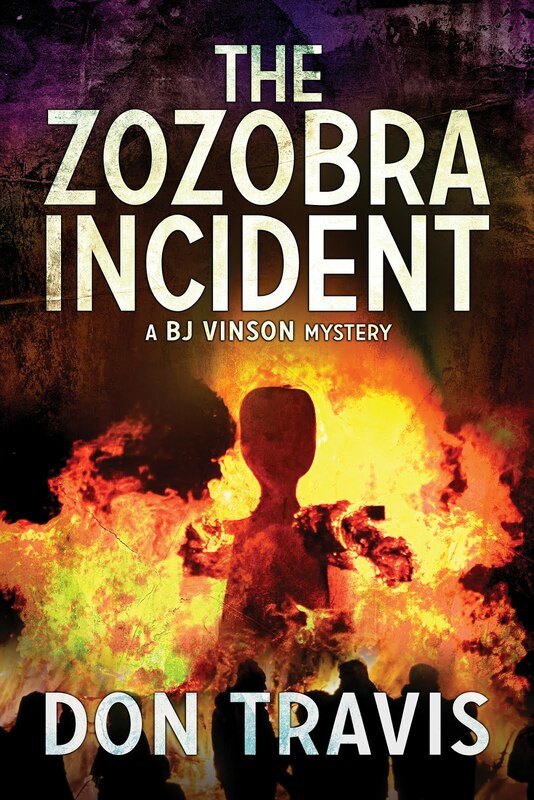 The Zozobra Incident describes Albuquerque, Santa Fe, and points between. 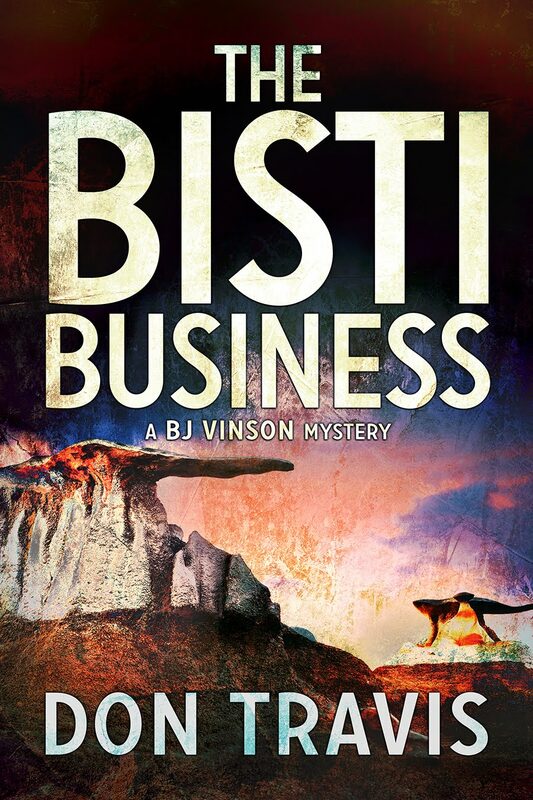 The Bisti Business takes us to Taos and across the state to the Four Corners area around Farmington and Shiprock and the Bisti Wilderness area. The City of Rocks explores the southern and Boot Heel sections of the state. And that leaves so much not yet covered. The purpose of this post is to reinforce the image of a fascinating state by showcasing only three of the state’s National Monuments. This is not a scholarly discussion of the sites, in fact there is amazingly little prose appended. I’ll depend upon the spectacular photographs to do the job. All are courtesy of Wikipedia Creative Commons. The brief descriptions are provided by Wikipedia, as well. This is a US National Monument located about 16 miles southwest of Alamogordo, covering a part of both Otero and Doña Ana Counties. We have all seen photos similar to the one on the left, but I suspect few of us have viewed the monument from space, as seen on the right. 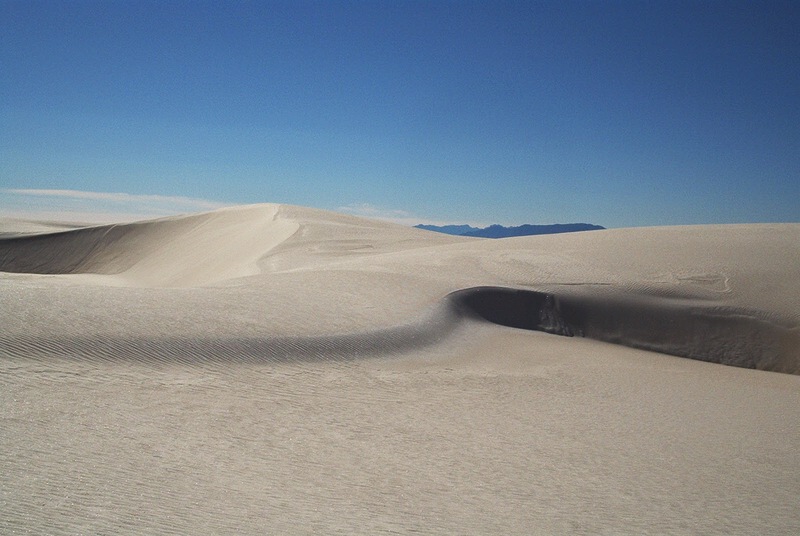 The area is in the Tularosa Basin, covering part of a 275 square-mile field of gypsum dunes … the largest in the world. Because gypsum is water-soluble, it is normally dissolved by rain and carried to the sea. The Tularosa Basin is mountain-ringed and has no outlet to the sea, so the dissolved gypsum is trapped. 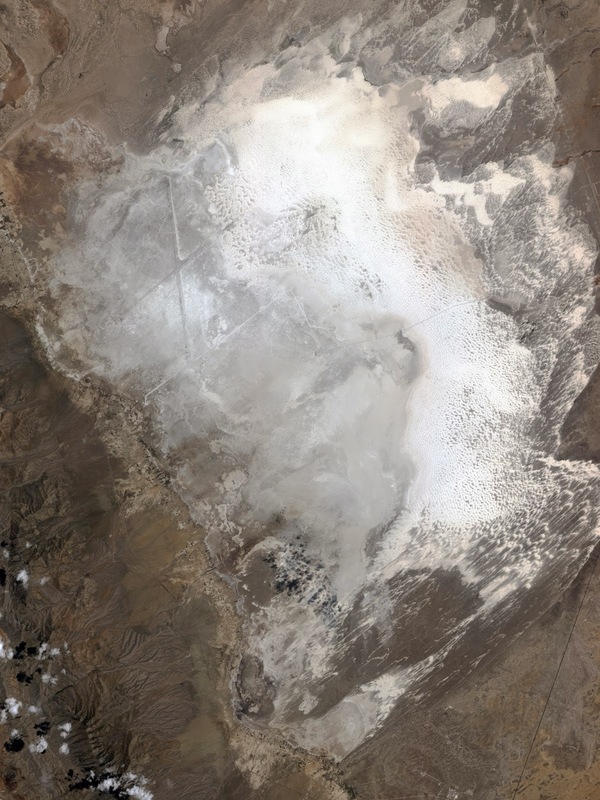 As water either sinks into the ground or evaporates from shallow pools, gypsum in a crystalline form called selenite is deposited on the surface. Well worth a visit! A roughly 240,000-acre area of public lands in Taos County was proclaimed a National Monument on March 25, 2013. It contains the Rio Grande Gorge (visited in The Bisti Business and in prior blog posts) and surrounding lands. 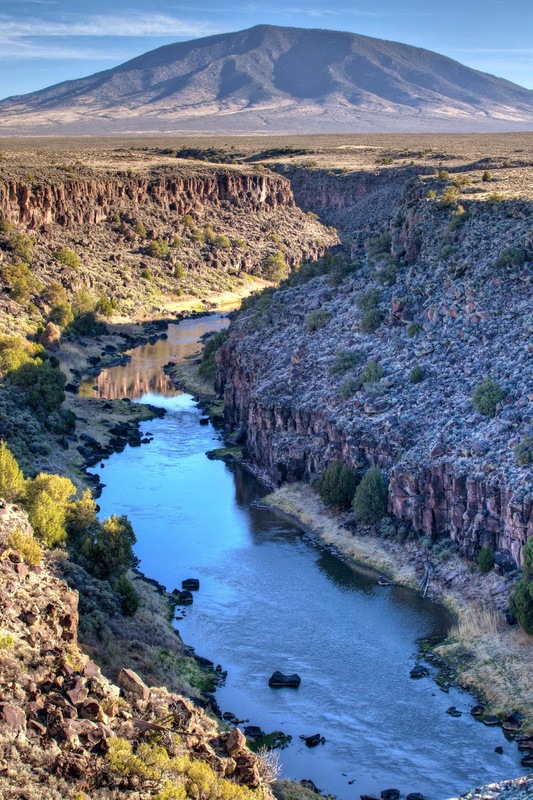 The monument includes two BLM recreation areas: a portion of the Rio Grande which has been designated as a Wild and Scenic River, and the Red River Wild and Scenic River. The city of Taos is a logical starting point for a rewarding visit. Heck, Taos, itself, which is a noted Art Center, is worth the trip alone. This Bureau of Land Management supervised site is located 40 miles southwest of Santa Fe, near Cochiti. One passes the Santo Domingo Pueblo (recently renamed Kewa Pueblo) on the way to Tent Rocks, as it is commonly called. The area was created from layers of volcanic rock and ash deposited by a volcanic explosion within the Jemez Volcanic Field (also a subject of a previous blog post on the Valles Caldera) some 6 to 7 million years ago. 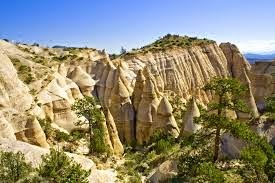 The weathering and erosion of soft pumice and tuff from caprocks over the years has formed cones called Tent Rocks as high as 90 feet in height. There is a 1.2-mile trail leading through Slot Canyon to a lookout point where the rocks can be viewed from above. The park is located on the Pajarito Plateau between 5,700 and 6,400 feet above sea level. This site is open only in the day and does not permit dogs. The monument may be closed by order of the Governor of Cochiti Pueblo during tribal holy days when the pueblo does not permit the presence of outsiders. Again, the photographs are courtesy of Wikipedia Commons (3). I hope this whetted the appetite for all of you to visit us and experience our natural wonders and get a taste of the three dominant cultures of our state: Native American, Hispanic, and Anglo. I came across Greg Willis's spectacular photograph of the Reconstructed Kiva at Alcove House in the Bandelier National Monument and could not help but stop and study it. Certain emotions welded up out of me, making me wonder what others think, see, feel, smell, and taste when they view such a sight. I’ll tell you what I see: A whole other culture as unfamiliar to most of us as life on Mars would be. Oh, we’ve seen photos and read snippets of history and believe we know all about those people. The Ancient Ones. The Anasazi. The Original People. But I sincerely doubt I would last a week living life on their level. True of most of us, I suspect. My intent is not to recount the history of the Anasazi, but to explore images beyond what the camera caught. I see a people who -- for whatever reason -- abandoned their desert cities virtually en masse and took to the mountains and high canyons of the southwest to build homes and compounds and even whole towns in cliff caves and on rock shelves, bringing with them a culture that was already old. When I look directly at the photo, I see what everyone else sees. 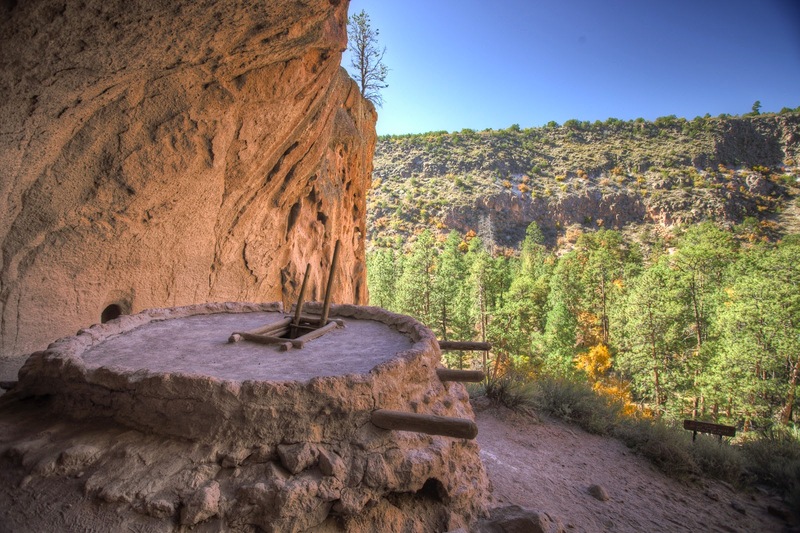 A Kiva, a religious building, in the Jemez Mountains of modern-day New Mexico set against a truly dramatic backdrop of stone cliffs and a lush evergreen forest. Let me tell you what else I see. I see a grandfather priest standing on top of the Kiva, shading his eyes as he watches his hunter-warrior son stride up the steep trail with a turkey over his shoulder, a kill to feed the family. I envision a woman in an unadorned deerskin dress, her long black hair gathered on either side of her head by rawhide thongs. She holds a woven basket filled with ears of corn just retrieved from a nearby granary. She is smiling, pleased her husband has returned safely from a successful hunt. I see a pre-teen boy and girl, bladder bags in hand, preparing to make their way down the long trail to reach the flowing stream on the floor of the canyon. Their task of descending and then climbing a vertical cliff is no less perilous than their father’s trek. But the family needs water. I see laughter and contentment amid grumbling and discontent. I see generosity and greed lying side by side. I see pain. I see health. I see perils we will never know … just as we face dangers they could not imagine. I smell the old man’s tobacco, probably smoked in the Kiva in a ritual manner, sweat from the warrior’s efforts, corn in the woman’s basket. I can almost taste dust and pollen swirled aloft by mountain breezes and pungent, bitter pine needles. Even a hint of wild flowers. I hear the labor of the man as he climbs the steep trail, the soft breath of the woman as she watches him approach, the excitement of the children. The lowing whisper of evergreens waving branches before the wind. And from somewhere far, far away, comes the faint rush of water over mountain boulders. I see a family of human beings living a perilous life on the steep side of a craggy mountain. A vanished people who are claimed as honored, somewhat mythical ancestors by thousands of descendants. Please write and tell me what you see: dontravis21@gmail.com.